On Monday, the 6th of September and Wednesday the 8th the 1 1/4 acres of ploughed ground was prepared and planted. What a party!! When we arrived on Monday, about noon - couldn't get there any sooner due to transportation issues - we found about 41 widows (one or two actually married folks) sitting in Marty's Prayer Chapel finishing their chai and bread! These women had come from all over the village and from several miles away in other areas to voluntarily work on the Widows Farm for their destitute sisters. Actually there were a few of the very old destitute widows amongst them (they were there for encouragement and to take care of babies). There was a man there - Joel - who was helping to oversee the project. 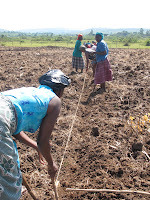 The women had spent the morning, from about 8 AM, tilling the soil to prepare it for planting of the maize on Wednesday. What a wonderful way to use that clump of Bondo Trees for the very first time. Charles, is the man who has been working so hard to clear the land of brush and weeds and ant hills, and digging ditches to control rainfall (to keep the ground from eroding and use the rain in the ditches to irrigate the crops by osmosis). He has cleared out the saplings and bushes that Marty wanted removed from the Bondo grove in order to make the area into a place where she can go to have quiet times and to have small groups of women over to pray and also have meetings. It is developing quite nicely, and when we arrived and saw how the women automatically went into it for shade and rest; we were delighted to see how it drew people to itself, and served an additional purpose from the original intention. No sooner did we get there than it began to rain. So they all got up an filed back to the church for shelter. When we got there we both told them, through a lovely lady who was interpreting for us, how wonderful they were to have spent the morning working so hard to see to it that the destitute widows - their sisters - would have food. John told them all that he thought they were so wonderful that if he wasn't married he would marry all of them! (Many giggles!) Of course Marty informed them all that he is "the husband of one wife" (more laughter). Now John has a long established history that has taught him not to try to make jokes in another culture. Yet, he still sometimes doesn't heed the little red flag that warns him. So, since his little jest went down so well, he went for another joke. He told them that he was going to buy a leso for Joel for the next time he worked with them. Note: A leso is a colourful piece of fabric, about 1X1.5 meters, that every village woman owns and uses for many different things. It is used to wrap around oneself to keep your skirt clean, to sit on, to wrap thing in to put on your head, to carry a baby, as a fan, to wipe perspiration off yourself, to protect yourself from the sun and sometimes rain, etc. They always have a proverb printed on them in Kiswahili - usually mentioning God. Well, there was much cheering, ululating and laughter!! Marty told John that his joke really went over big! He was quite pleased with himself!!! We did a whole lot of singing and dancing with them. (It takes very little to get villagers from the church to sing and dance.) A little bit later when we were making the plans for Wednesday - the day for planting the maize - Irene, our interpreter, asked when we would be bringing the lesos. Marty asked her to say it again to be certain she heard her correctly .... she had! What with his accent and the communication gap, instead of hearing him say "I will buy Joel a leso", she heard "I will buy you all a leso!) THAT'S why there was so much joyous reaction!! Then the leaders made a list of all the ladies that worked that day and added a few who had worked originally on the first crop but weren't there that day.All in all there were 47! When Marty told them that there was no way to have them by Wednesday because they would all need to be hemmed (on the ends), they said that they would be willing to wait to get them after church on Sunday. So, the next day Marty went to market in the village, and with the help of , an interpreter and also a seamstress, went to every vendor who sold lesos and bought up all that were in the market. Then on Sunday, after church, we used the list, called names and handed out the leso that was on top to the name that was called. The day they planted the corn we both wanted to help. John kept up quite well for a couple of rows. Marty wasn't as adept - they kept saying hurry up, faster, faster. Then one of the younger women gave me a leso and told me to go sit under the bushes with the old widows and hold babies. Marty protested that she wanted to work and the woman very gently explained that holding babies was her work. Do you want to know something? Those women are STRONG - they just kept going and going - determined to finish that day. By the following Wednesday the maize was beginning to germinate and on the 20th. 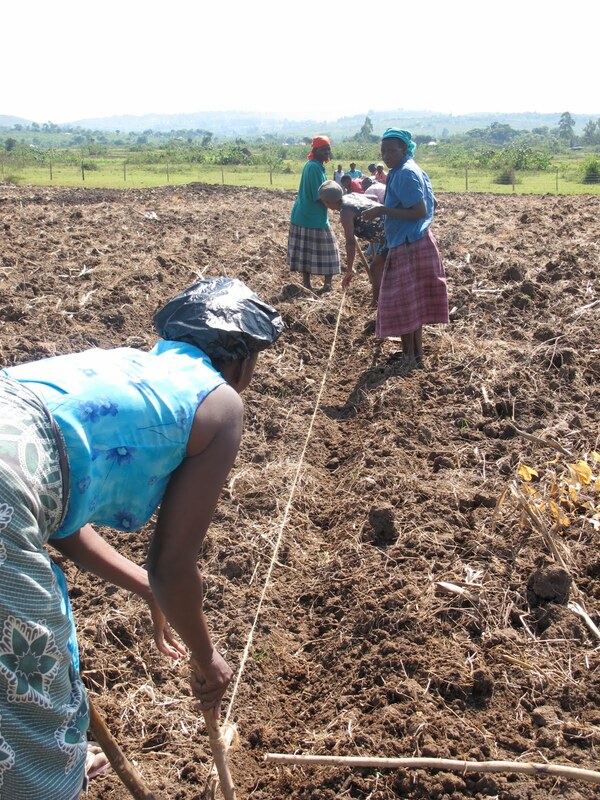 the women gathered again to plant beans along side of the maize. The maize stalks will act as bean poles, and the beans plants will restore nitrogen to the soil. A good time was had by all. We gave Joel a leso for his wife, since he couldn't wear one himself! It was a pleasant and much cooler job! Be Blessed - Every one of you! 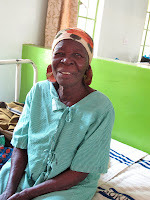 Wednesday morning, Sept. 1, three of the old widows - Lorna, Peres and Catherine - went into hospital for cataract surgery. We had 4, but one got sick and couldn't make it. They are in the Provincial Hospital and once again we have come upon something that we just wouldn't even think about - in our wildest imagination - in terms of culture. We had some extra expenses that morning. Violet, the pastor's wife, had to stop and get Lorna some slippers (flip-flops). Lorna was barefoot - she doesn't own any shoes. Violet didn't want her to have to walk to the bathroom in bare feet. (Hesbone said he has never seen Lorna with shoes.) Also, Violet had to buy 3 cups, 3 plates and 3 spoons so that the ladies could eat. One "younger" widow went along to help Violet and the ladies. She had to take them to the toilet several times. Most likely these women were very nervous and probably had never been to a hospital before. They couldn't see to get to the toilet by themselves. Lorna had to cover her head and just look out of a hole because the light hurt her eyes so badly. Here is her photo with the patch just after surgery and then the one the day she went home. We did incur some extra expenses - as happens. There were some added medicines and also other hospital fees that hadn't been factored in. Two extra bonuses are:1. that the doctor assigned to the clinic is actually from Kadawa; 2. There is a one-year waiting list for cataract and other eye surgery- these surgeries are being done immediately. Praise the Lord! 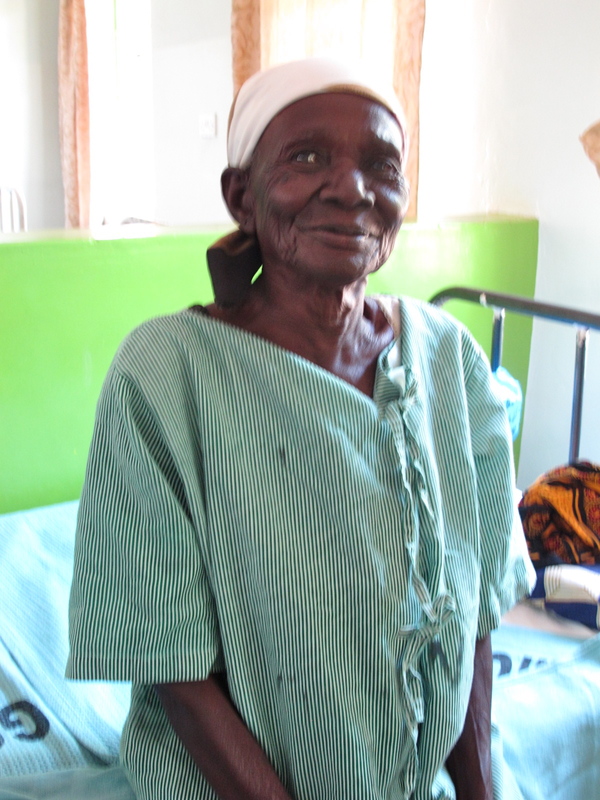 On Friday, Sept. 3, we went to get the widows from the hospital after having their cataract surgery. What happy ladies they are. Marty cried a whole lot (again). When we came in and the one old dear saw us she just hugged Marty and kept saying over and over "Erokamano, erokamano, erokamano....." (Thank you, thank you, thank you....) As we said, all had to be helped to the bathroom when they got there on Wed. 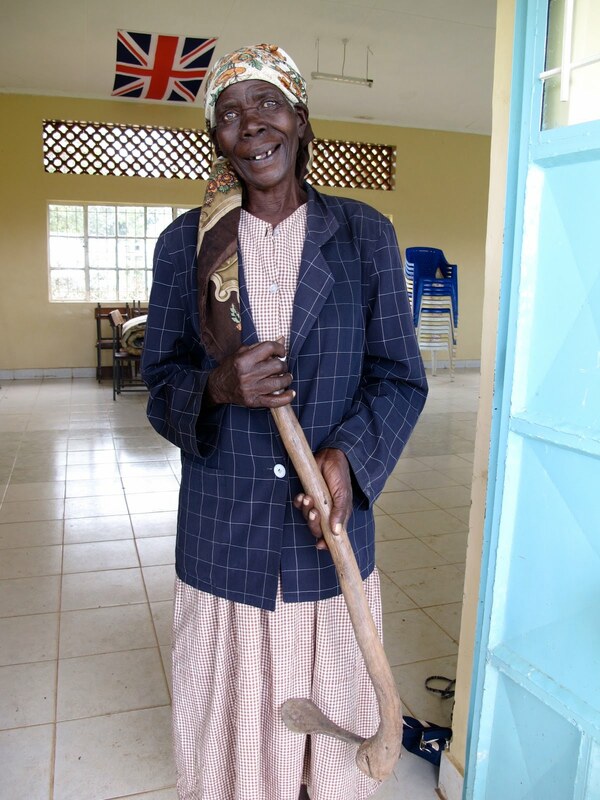 But while we were there today, Old Lorna got up, took her stick, and walked herself to the bathroom. She thanked God and thanked us. 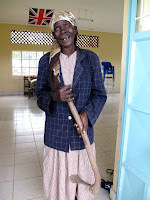 Although she has two cataracts the doctor won't operate on the other eye. She was greatly abused by her husband, and it seems that he must have blinded her in the other eye. So the restoration of her sight is ever so precious to her. John stood next to Hesbone and had him ask Lorna if she could see which one was the "mzungu" (white man). (Lorna only speaks Luo.) She said, of course she could. She pointed to Hesbone and said you're the black man and then to John and said you're the white man! Then we all had a good laugh, including Lorna! We took her photo and it is the very first time we've ever seen her smile. Other than when she came to get a new dress last year, we have only seen Lorna in church once – and then she introduced herself to the congregation as a visitor (as they do). Well, today she said she can hardly wait for Sunday so she can go to church. We are pretty certain that she will tell the whole church what the Lord has done for her. Lorna is in her 80s. She may die soon. But she will die with much more dignity and she will die seeing once again. When I asked Peres if she was afraid before the surgery she said - no, not at all. She said that she knew that only God could have put it on our hearts and minds to think about the widows and to have an eye clinic. She said that since she knew He did that she also knew He was making this operation possible and was there with her - therefore, she wasn't the least bit afraid. It was a wonderful event! We never did see them leave. It isn't easy getting someone out of a hospital here. They don't move anyplace until every shilling is paid. They kept having Violet running all over the grounds. She had to go get prescriptions, then had to have them filled, then had to get medical summaries from the doctor. While waiting for all of this, the ladies got all ready to leave and were perched on their beds. After a bit a nurse or orderly came in and told us that the old ladies said they didn't want to go home until they had had their meal. (You see, they have so little to eat at home, and also it is a wonderful treat for them to have food prepared and served to them.) So we all had a laugh over that and John and I left with Hesbone - leaving Violet to deal with it all. We got another call later that there were some other expenses that hadn't be communicated to us and we had to work that out. We will make arrangements for next week to have little Mary's eye repaired - she has a corneal adhesion. Some of the people will only required prescription eye glasses. We have realized that some of the children will be able to improve their school work because they couldn't see well to learn and do their work. One little boy came to town with his dad - one of the pastors at RCC - to have further examination and get a prescription for glasses. It may have been the first time, or surely was one of the few times he has ever been to town and you could tell that he was a bit afraid (although he wasn't about to show it). Next week little Mary will receive surgery for a congenital corneal adhesion; the doctor said that we got her just in time - if she went past this year she would be blind for life in her one eye. We will also do Dancan who has never been to school because of his eye condition - he's 11 years old. 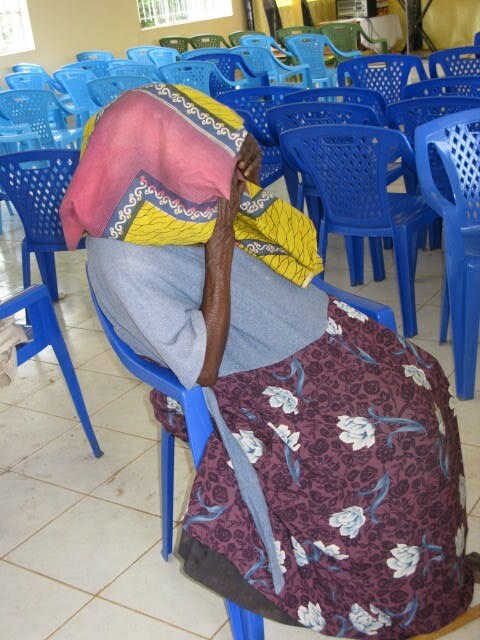 In addition we plan two or three more cataract surgeries for widows. 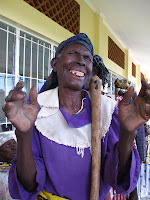 The news is spreading fast about the ladies and people are approaching Hesbone asking for another eye clinic. We won't be holding one for awhile - not until we have raised enough funds to pay for the rest of the operations. NO WAY! I'M NOT DIGGING THAT HOLE!! Here is another cultural gem! Hesbone was telling us of the great difficulties one of the ladies had in building a new house in the village. She is a widow! She is a retired nurse and has lived in town for many years, but she wanted a house on her land in the village. She had all of the materials, but couldn't get anyone to do it. Here is why: since she is a widow, and hasn't been inherited, whoever digs the first hole to put in an upright pole to build her house becomes her husband!!! So not one man would be the first to start building her house. She was desperate and went to Hesbone, as her pastor, and told him of her plight. He made the arrangements for the "fundis" (skilled workers) to go to the site. Then he told them she needed her house and he was going to confront and deal with this cultural issue himself - he then dug the first hole! He let them know that she isn't his wife and he hasn't inherited her. Once the hole was dug, the men got on with it and built her house. That was the end of the whole thing! We will be building another widow's house this week - it appears there will be no issue about digging the first hole (hopefully)!